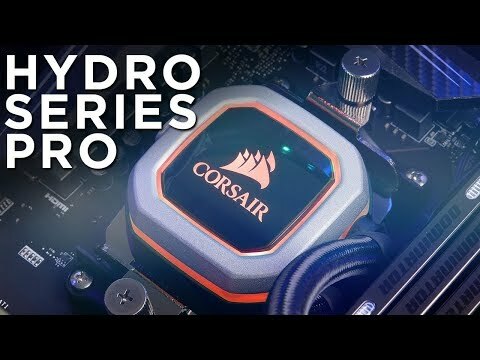 HYDRO SERIES SELF-CONTAINED COOLING SYSTEMThe CORSAIR Hydro Series H150i PRO is an all-in-one RGB liquid CPU cooler with a 360mm radiator built for low-noise cooling performance and bold styling with an RGB LED pump head. Three included 120mm ML Series magnetic levitation PWM fans provide great airflow while producing no more than 25 dBA of noise, pushing the performance of your build while staying whisper quiet. Take control with CORSAIR LINK software and customize lighting, monitor temperatures and precisely adjust fan speeds, or stop the cooling fans entirely with the H150i’s Zero RPM fan mode. Easy to install and compatible with most modern CPU sockets, the H150i makes it easy to cool your system in silence and style. low-noise RGB LED pump Vibrant RGB LED pump head produces vivid lighting effects to add a touch of brilliance to any build. The H150i Pro also features advanced pump speed control options to maximize performance or minimize noise. HIGH DENSITY RADIATOR The specially designes 360mm wide radiator offers excellent cooling potential. It not only doubles the cooling surface but also comes with 3 x ML120 Fans for additional heat dissipation. ZERO RPM MODE CORSAIR LINK software allows you to adjust RGB lighting, individual fan speeds, and pump speed while monitoring CPU and coolant temperatures, and more. Zero RPM cooling profile allows fans to stop entirely at low temperatures, eliminating fan noise. 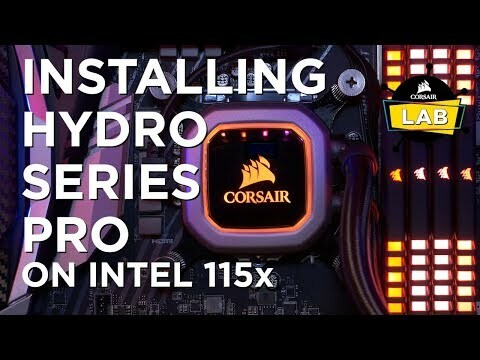 Corsair Hydro Series H150i PRO RGB, 360mm All-In-One Hydro CPU Cooler, 3x 120mm ML Series Fans, RGB Pump Head, Intel/AMD is rated 5.0 out of 5 by 9. Rated 5 out of 5 by vMax23 from Impressive performance and very quiet... I have an i7-8700K and wanted to overclock so I decided a good cooling solution would be required. The H150i Pro was at a great price, though not cheap and I decided to go for it. 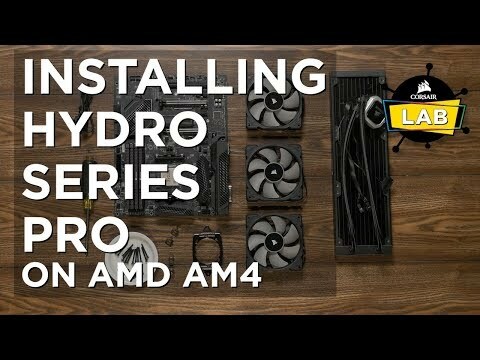 Installation was simple due to Corsair's tried and trusted method, something I have used in the past with H100i, so absolutly no issues. So after cranking the 8700K upto 5 GHz, I was super impressed with the cooling perormance. In Prime95 version 26.6, I maxed out at 72 degrees and this is at 5 GHz and 1.328v. The software I used with it was Corsiar Utlility Engine (CUE) and it works perfectly synching my Corsair Rapid Fire Keyboard and My Corsair Void headphones to the RGB function and with my Motherboards RGB function in the Gigabyte Z370 Gaming 7. Controlling the pump speed via CUE worked as well and I have it running in balanced mode.Overall it does a fantastic job, very impressed in deed. Rated 5 out of 5 by Jdon01 from Amazing RGB AIO Water Cooler Amazing AIO water cooler for your PC setup. I’m personally a big fan of Corsair and love all there RGB product and this is a great cooler for my i7 8700k. Good for a decent overclock if your looking to do so. I’m a bit disappointed it did not come with RGB fans but I bought my own (3 x Corsair LL 120mm) so no problem. I’d say the only issue I have with it is that it’s really big. I could just fit it in my case, but other than that I’d say this is anouther amazing product form Corsair and I’m happy with it. Rated 5 out of 5 by Mikeyuk165 from Excellent Aio Cooler Corsair does it again with this aio cooler, u can tell the quality when you get it out the box it has a thick radiator with good fin setup and great fans for great Airflow and excellent pump to keep your cpu nice and cool with RGB thrown in for those that like rgb temps with this cooler are much lower and more stable if you don't like the idea of custom loops I recommend you get this aio as it is one of the best at the minute. Rated 5 out of 5 by Ray1996 from A lot for something without a huge amount of diffrence A little awkward to install I'm my motherboard my bios didn't like it at first but after fiddling about my aio pump isn't detected but it's working along with all 3 fans. The thing defiantly does it's job, my ryzen 7 1700X has yet to hit above 50oc even on heavy loads after being over clocked. I keep benchmarking this thing and no matter how intense it stays around 45oc. The issue,some fan coolers that are a bit cheaper can provide not the same but a similar result. If you have intentions of overclocking a cup to a high GHS then yeah this is for you, If you want something in your board that looks very pretty this is for you, or maybe and older cpu like a FX9000 then yeah this is for you. If I replace the fans with 3 pin DC fans, will everything still work properly? I already have Corsair AF120 fans, seems a shame to not use them, so would they work as a replacement to the stock fans even though they are 3 pin DC not 4 pin PWM? Thank you. Will the H150i fit inside Corsair Obsidian 450D case? Does anyone know if this 360mm AIO cooler fits within the Corsair Carbide 540 Air case, and will it sufficiently cool an Intel i9-7900X?